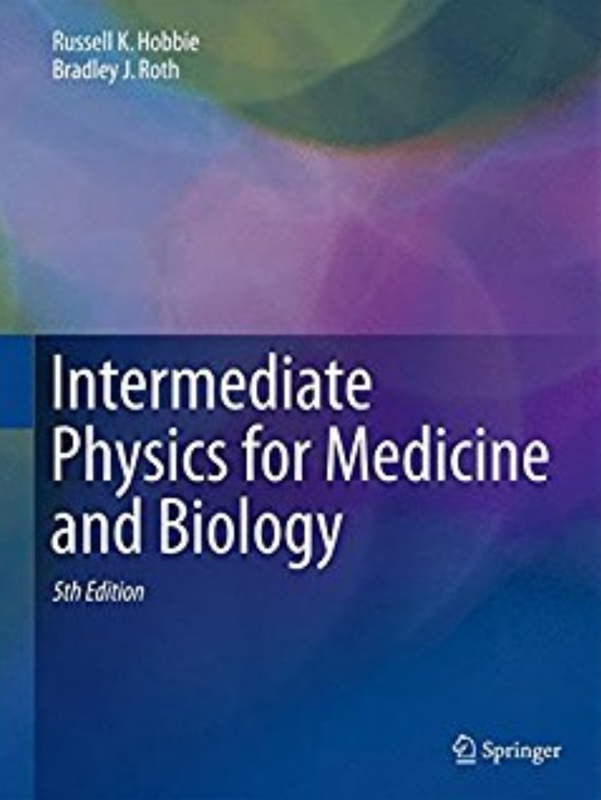 Table 3.1 in Intermediate Physics for Medicine and Biology lists some constituents of blood. I reproduce the table below, with revisions. This version of the table highlights several points. Water molecules outnumber all others by a factor of four hundred. Sodium ions are sixty times more common than hemoglobin molecules, but the mass density of hemoglobin is over fifty times that of sodium. In other words, if judged by number of molecules (and therefore the osmotic effect) sodium is most important, but if judged by mass or volume fraction, hemoglobin dominates. Glucose and cholesterol are intermediate cases. Albumin has a surprisingly small number of molecules, given that I thought it was one of the main contributors to osmotic pressure. It is a big molecule, however, so by mass it contributes nearly a third as much as hemoglobin. Are other molecules in blood important? You can find a comprehensive list of blood constituents beautifully illustrated here. When judged by number, sodium is the most important small ion, but the chloride ion contributes nearly as much. Carbon dioxide and bicarbonate are also significant, and potassium has about the same number of molecules as glucose. If you drive drunk, you may have twice as many ethyl alcohol molecules as potassium ions (if the number of ethanol molecules reaches the level of sodium or chloride ions, you die). Urea has a similar number of molecules as hemoglobin. Judged by mass, you get an entirely different picture. Large protein molecules dominate. Hemoglobin is by far the largest contributor to blood by mass (after water, of course), followed by albumin and another group of proteins called globulins. Next are glycoproteins such as the clotting factor fibrinogen and iron-binding transferrin. Many trace constituents hardly affect the osmotic pressure or density of blood, but are excellent biomarkers for diagnosing diseases. If you’re starting to think that blood is awfully crowded, you’re right. 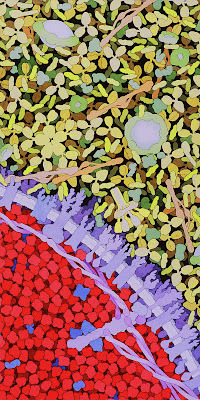 The picture below is by David Goodsell. No scale bar is included, but each candy-apple-red hemoglobin molecule in the lower left has a diameter of about 6 nm. The water, ions, and other small molecules such as glucose are not shown; if they had been they would produce a fine granular appearance (water has diameter of about 0.3 nm) filling in the spaces between the larger macromolecules. Blood. Serum is in the upper right and a red blood cell is in the lower left. In the serum, the Y-shaped molecules are antibodies (an immunoglobulin), the long thin light-red molecules are fibrinogen (a glycoprotein), and the numerous potato-like yellow proteins are albumin. The red blood cell is filled with red hemoglobin molecules. The cell membrane is in purple. 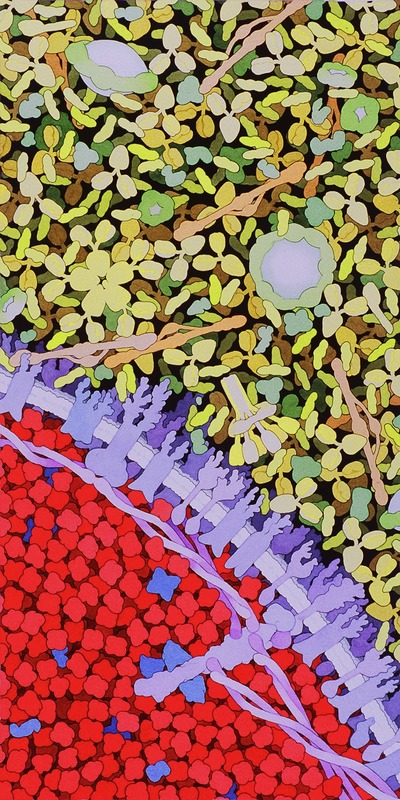 The illustration is by David S. Goodsell of the Scripps Research Institute. In another eight weeks I will get free juice and cookies be eligible to give blood again. It doesn’t hurt (much) or take (too) long. If you want to donate, contact the American Red Cross. Give the gift of life.